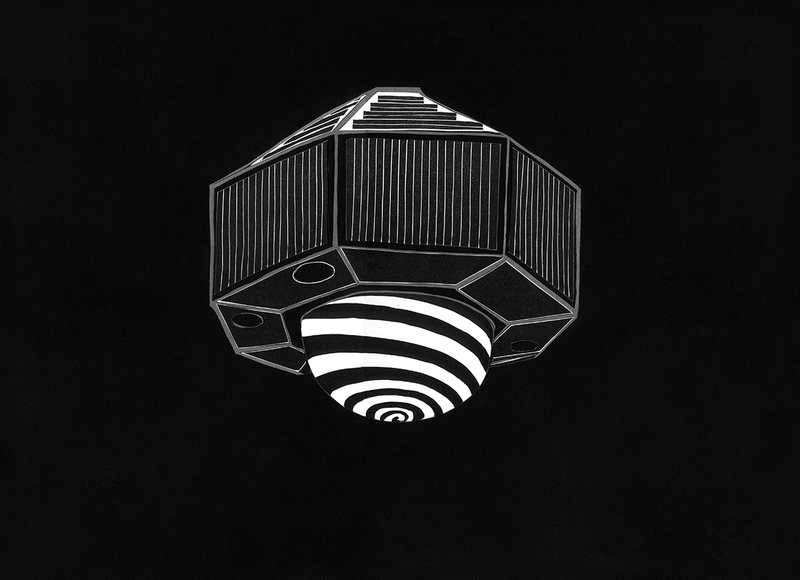 A series of prints commemorating defunct satellites which remain in orbit today, made by letterpress print collage; two images from the same linoleum block were combined for each image, one black ink on white paper, one silver ink on black paper. PROSPERO x-3 (satellite commemoration), 2012. 22.5 x 13.75 in, letterpress print collage, edition of 10. 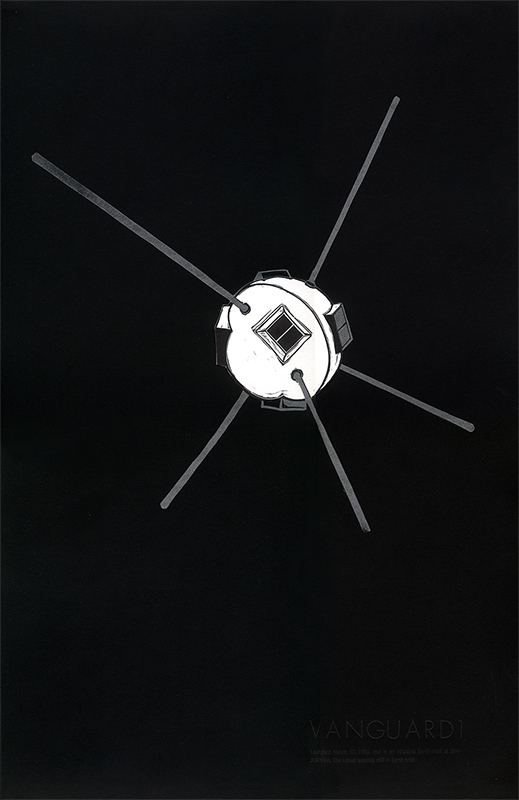 Launched October 28, 1971, and in Earth orbit at 531–1402 km. First UK satellite launched by a UK rocket, the Black Arrow R3. SNAP 10A (satellite commemoration), 2012. 22.5 x 10 in, letterpress print collage, edition of 10. 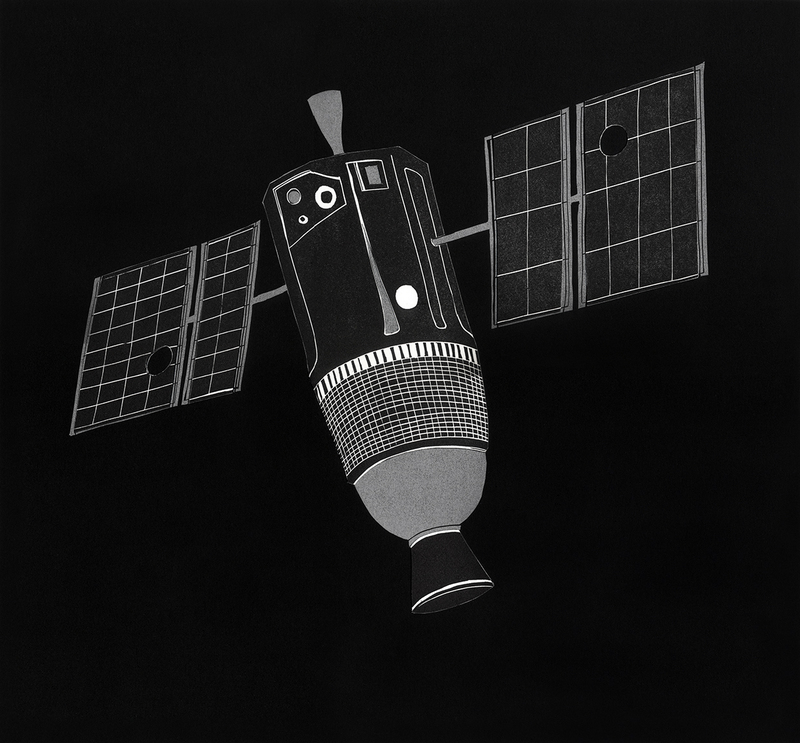 Launched April 3, 1965, and in Earth orbit at 1268–1317 km. The first US nuclear reactor in space. VANGUARD 1 (satellite commemoration), 2012. 22.5 x 13.75 in, letterpress print collage, edition of 10. Launched March 17, 1958, and in an elliptical Earth orbit at 654–3,969 km. The oldest satellite still in Earth orbit. SYNCOM 2 (satellite commemoration), 2012. 22.5 x 13.75 in, letterpress print collage, edition of 10. Launched July 26, 1963, and in Earth orbit at 35,584–36,693 km. Experiments with voice, teletype, facsimile, and data transmission. PIONEER 4 (satellite commemoration), 2012. 22.5 x 10 in, letterpress print collage, edition of 10. 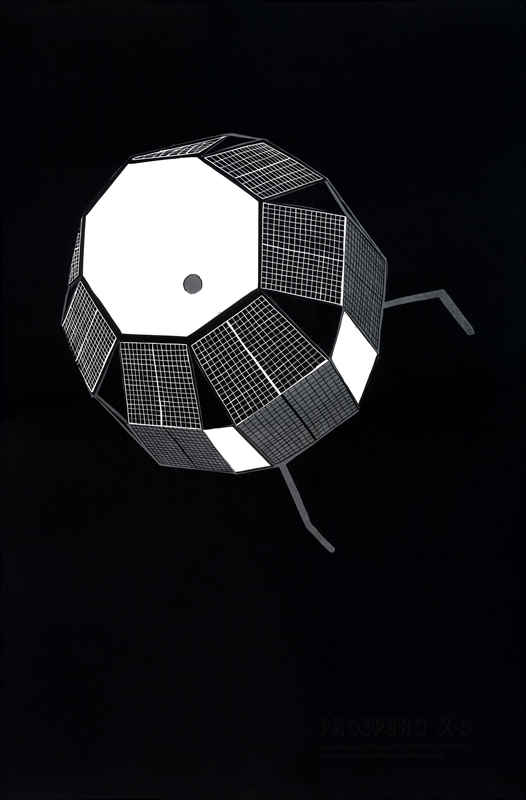 Launched March 3, 1959, and in solar orbit—named Artificial Planet Two. Carried early lunar radiation and photoelectric experiments. LUNA 1 (satellite commemoration), 2012. 22.5 x 13.75 in, letterpress print collage, edition of 10. 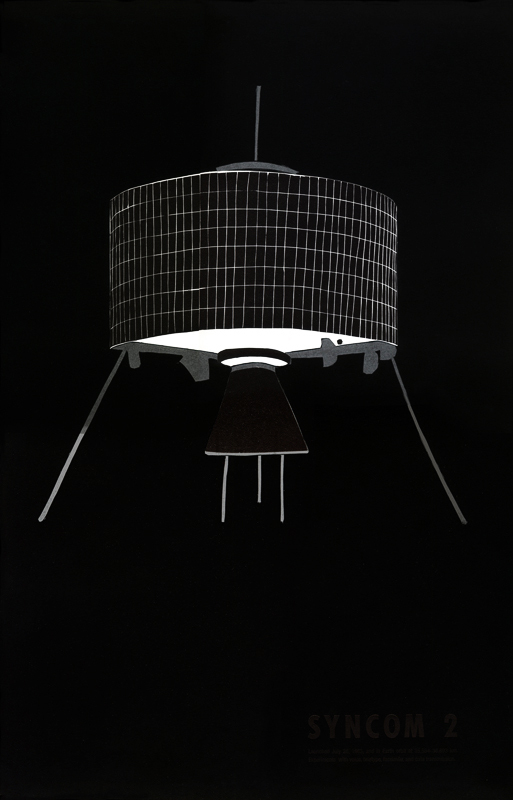 Launched January 2, 1959, and in solar orbit between Earth and Mars. Provided new data on solar wind and Earth’s radiation belt. EXPLORER 11 (satellite commemoration), 2012. 22.5 x 10 in, letterpress print collage, edition of 10. Launched April 27, 1961, and in Earth orbit at 476–1,317 km. The first space-bourne gamma-ray telescope. TRANSIT 4A (satellite commemoration), 2012. 22.5 x 13.75 in, letterpress print collage, edition of 10. 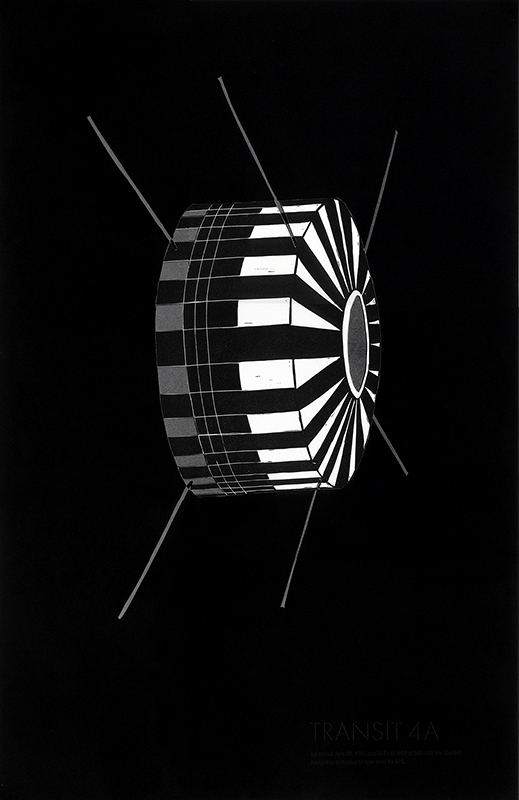 Launched June 29, 1961, and in Earth orbit at 881–998 km. Carried navigation technologies later used for GPS. AMSAT OSCAR 10 (satellite commemoration), 2014. 14 x 19.5 in., letterpress print collage, edition of 10. Launched June 16, 1983, and in Earth orbit at 4,112-35,350 km. Supported amateur radio communication, launch mishaps damaged it and placed it in an unintended orbit. 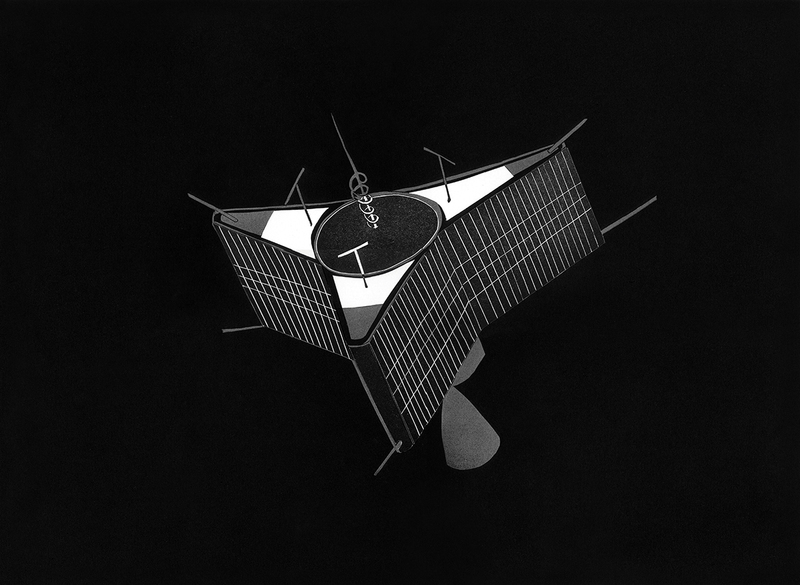 EXPLORER 29/GEOS A (satellite commemoration), 2014. 14 x 19.5 in., letterpress print collage, edition of 10. Launched November 6, 1965, in Earth orbit at 1,123-2,280 km. Measured the structure of the earth’s irregular gravitational field. CLEMENTINE (satellite commemoration), 2013. 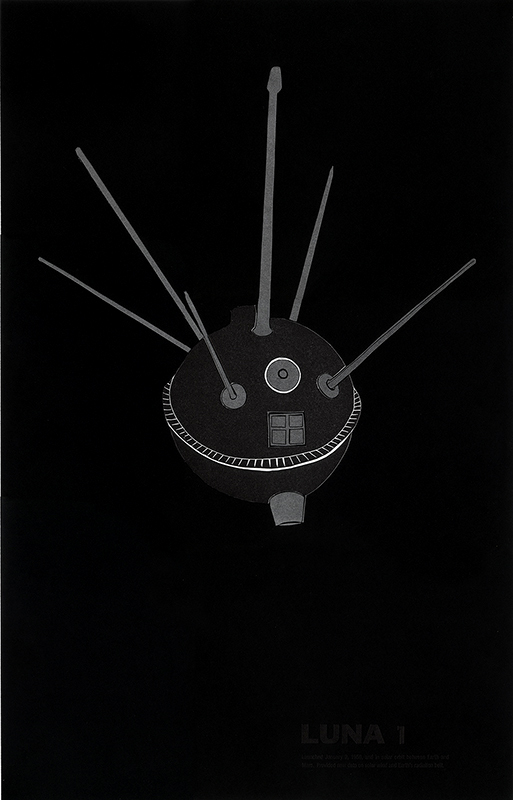 14.75 x 16 in., letterpress print collage, edition of 50, published by the Center for Book Arts. Launched January 25, 1994 and is in Earth orbit at 2,162-4,594 km. Assessed the surface mineralogy of the moon, and intended to do same for the asteroid 1620 Geographos but computer malfunction ended mission prematurely.